Coming down the slope that leads into Tate Modern’s Turbine Hall, Miroslav Balka’s giant steel box remains hidden by the permanent bridge that cuts the space in half. 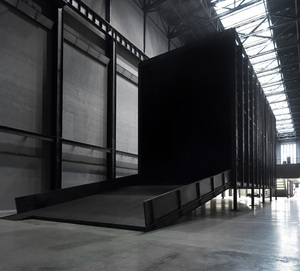 A dark, mysterious object gradually appears in view at the far end of the building, which demands a journey to fully explore and comprehend. An inaccessible rectangular box comes into focus, but on walking it’s full length, you discover a slyly concealed ramp on the far side that guides visitors into a dark chasm. Climbing to the mouth of this void requires more exertion than courage, but poised on the threshold to enter, all our fears of darkness, reminiscent of childhood, induce a profound anxiety about proceeding any further. Having summoned enough determination to walk into the box, you’ll discover a velvety darkness that admits a low level of light from the hall much like sunlight filtering down to the seabed. It’s an unnerving experience summoning up one’s deepest, primal fear of the unknown and destabilizes the vision normally employed to guide you through an unfamiliar environment. Balka’s Unilever commission assumes a magnified geometry that diminishes the human visitor. Metallic, functional walls embody the modern age of mass-produced parts bolted and welded together without concern for aesthetic appeal beyond efficiency and economy. A giant box resembling a container used to ship much of the world’s goods lies stranded, stripped of any functionality. However, its contents of air produce a baffled disappointment, for this is not an Aladdin’s cave. Initial shock soon gives way to something much more disturbing and tragic. This empty structure begins to assume historical associations. While children shout with pleasure and run around, those familiar with 20th century history may well associate this sculptural installation with the transport of human cargo in the Holocaust. More recently, refugees fill similar containers in desperate flight from other life-threatening persecutions. Balka’s work directly addresses the experience of his hometown in Poland where an entire section of the population was deported and murdered within living memory. His over-arching theme is the impact of history. In the moment we suppress our hesitancy about entering his large box, the deep abyss arouses our instinct for survival by playing both on the imagination and by undermining our sense of well-being. With its overt historical allusions, ‘How It Is’, becomes the most politically charged commission in the Unilever series. Above all, the sculpture becomes a solemn warning of our capacity to harness mathematical reason and base materials for wholly destructive ends. Very evocative review. Next best thing to living round the corner.